If you’re felling at all resentful or apprehensive about the added layers of complexity of the whole service system - as opposed to just creating simple functions, for example - this video does a quick review of the benefits of going the service route to help you get pumped about the long term benefits. Now, if you have a procedural programming background like you've worked with Drupal before and you haven't really worked with object orientation a lot and you're still feeling some resistance to this because it seems like overkill for supplying what could be just a simple function, let me try to recap exactly what we're getting from using this structure. So, if you imagine creating a function that's called blind d8 underscore get underscore tagline, and we put that inside of our dot module file. 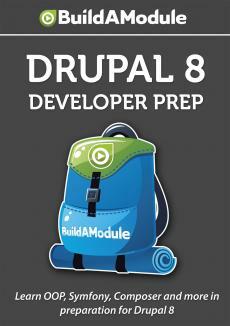 Now, that function is available to us across the entire Drupal code base. We can access it and get that tagline just like we can a service, but it seems a lot simpler. Right? We have just this function call instead of having to create a service and then register the service with a YAML file and then call it as a service. We can just define a function and call the function. Right? Okay. So, that does seem simpler and it is simpler, but here's the things that we don't get from that. First of all, that code is going to be loaded on every single page. So, if we use that as a pattern that we're using for all of the utilities that we supply as kind of a public API for our module, then that code will get loaded every single time, even when we don't need it, and most of the time we won't need it. So, with one function that's not a big deal, but with 100 or 1000 functions that starts to add some memory load that we don't need. So, the way to get around that is by using autoloading which allows us to include files on demand, and the only way to use autoloading is by using classes. So, let's say that you're convinced. Okay. I'm going to use a class to wrap around this, and we'll use autoloading. So, whenever we create an instance of this class, it pulls in the file that is responsible for that class. That makes sense. Okay. So, we've transitioned now from using a function to using a class. But now why don't we just call that class whenever we want to? Why do we need to go and register it as a service? Well, the first reason is what if we want people to be able to override the result of this service? If we were just calling the method directly, then we would force the user to use some other means to manipulate that output or that logic. In this case we're returning some text, and what if somebody wanted to override that text? Well, they'd have to hook into Drupal after that class was called and we got the text back in order to find where that text is maybe in a render array or something and then override it there.